Science World’s newest feature exhibition Animation, in partnership with the Vancouver Film School and Cartoon Network, unravels the mathematical process that goes into the art of animation. Animation is a highly educational and entertaining experience, offering Science World patrons the chance to get hands-on experience with the animating process. Just like the cartoons that it showcases, it offers something for the whole family: children can enjoy fun games while surrounded by graphics of their favourite characters, and parents can sit and watch shows both retro and modern in the screening theatres. Like other Science World exhibits, Animation is extremely hands-on. Patrons are invited to dub scenes, act as a foley, and even put together a storyboard that a computer will then animate; each activity includes scenes and characters from classic and popular Cartoon Network cartoons such as Codename: Kids Next Door. Character models made of plastic and clay are set in cases raised above the monitors, safe from curious little hands but low enough so that children can comfortably see them. Traditional animation comprises only a part of the exhibition. Visitors can try their hand at stop animation using various tables and cameras. Interactive monitors explain how scientists use the same theories and programs of 3D animation in order to create models of DNA or skeletons. It connects the world and art of animation to practical applications in science, and it sparks an interest in children by linking the techniques used in scientific animation to animation that they watch every day. The activity section takes up the first half of the room, which allows visitors to immediately jump into the fun. At the back of the room is a museum dedicated to the history of animation. It is a look at how animation has evolved over the years and how it has shaped Western culture. A screenshot of an old ad for Kellogg’s Cornflakes featuring Yogi Bear as the salesperson shows the popularity and influence of the Hanna-Barbera character. Collector’s items such as Pixie & Dixie books and a Dynomutt board game, along with descriptions and the years that they were released, are lined up like ancient treasures. Storyboards and concept art of The Jetsons and Yogi Bear allow us to see that how classic childhood favourites came to be. Hanna-Barbers’s visual and animation style is known to have a “pared-down visual style, emphasizing dialogue, sound effects, and repeated motion” (Mittell, 69), which is notable in a section of the storyboard for The Jetsons, in which George and Judy are both missing their feet. It is a way for animators to take a shortcut when they are drawing a scene; the lack of feet would be camouflaged using the background as well as the screen. 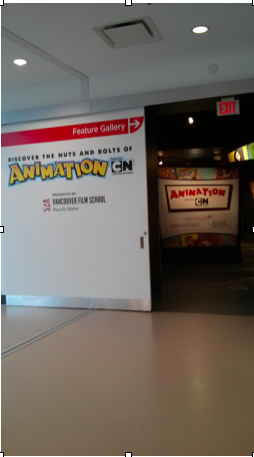 Science World’s choice of featuring mainly Hanna-Barbera cartoons in their museum as well as their screening room seemed odd to me, as I felt as if the only patrons who seemed excited about Yogi Bear or Snagglepuss were people my age or older. But modern Western animation was revolutionized by the popularity of Hanna-Barbera; without their success, the high quality of some of today’s cartoons may never have come to be. 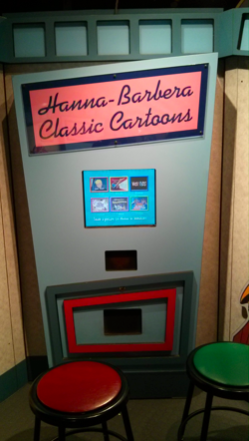 According to Carol Stabile’s book Prime Time Animation: Television Animation and American Culture, Hanna-Barbera changed the perception that cartoons are low culture entertainment for children with the creation of shows such as Tom and Jerry, The Flintstones, and Huckleberry Hound. They turned animation into what it is today: a medium that bridges the generation gap, and an art form that can be both enjoyed and critically reviewed by an older audience. A TV Guide reviewer sums up the appeal of Huckleberry Hound as, “Children like the show because of the action and the animals … Adults like the show for its subtleties, its commentary on human foibles, its ineffable humour” (qtd. in Mittell, 70). The secret of Hanna-Barbera’s success was the usage of adult wit, such as malapropisms, puns, and, the usage of tropes commonly found in the family-friendly genre of the sitcom. 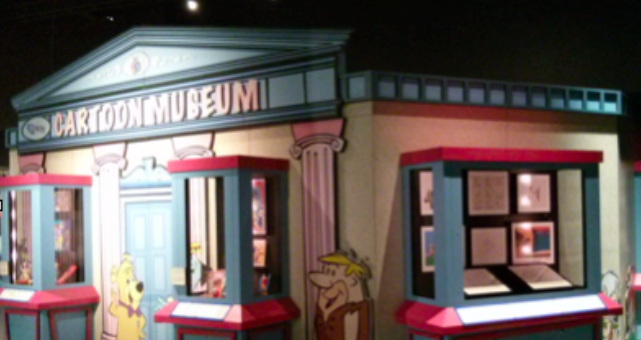 The ‘screening room’ allows visitors to relive the past glory of Hanna-Barbera by show-casing twelve classic seven-minute shorts. Due to the grainy quality of the audio and the lack of subtitles, it is occasionally difficult to hear and understand what was going on in the shorts, especially if a large number of the interactive elements are being used at the same time. Literally right behind the screening section is the foley room, which constantly emits loud and increasingly annoying sound effects. It is a shame that Science World does not provide headphones of some kind in order to let viewers hear the dialogue, as the strength and charm Hanna-Barbera’s cartoons are arguably situated in puns and jokes rather than slapstick. The problem of sound interference is one that persists throughout the entire exhibit. The second screening area, which broadcasts excerpts from Cartoon Network shows starting from the late 90s, suffers the same issue. The foley room is also in close proximity to the dubbing station, which means that the sensitive microphone picks up whatever sound effects that is produced from the foley room. The large space of the exhibition room is not properly used, as many attractions that require microphones or slightly quieter environments are much too close to the foley room, and stations near the entrance that just require reading are too spaced out. The empty spaces in between stations, especially near the entrance, are jarring because it gives the exhibition a very lonely and dull look, which is at odds with the colourful subject matter. The entrance to the exhibit is quite dark and empty compared to the Search: Sara Stern Gallery right across from it. The colourful graphics of characters on the walls do not do a good enough job on their own to distract children and convince them to play on the stations; oftentimes, I would see parents sitting children down in the theatre or ushering them to play on the machines, as children were more interested in playing tag. The large exhibition room feels lonely and gloomy due to the dark lighting, and the lack of physical structures or large character models on the floor to lessen empty patches. The presence of character models near stations may give the room more life, as well as convince children to play on the stations instead of just with each other. Despite the large and bright drawings scattered upon walls and throughout the exhibit, the empty atmosphere occasionally lacks the excitement and life that is present throughout the rest of Science World, even when it is full of children. Animation at Science World is a fun and unforgettable experience, in which visitors can see the blending of the past and the present, and the fusion of art with technology. Though it is a feature exhibition, it lacks visual impact in its presentation, and the open layout of the exhibition creates difficulties when trying to enjoy the animation shorts. The film exhibition goes until April 26, at the Telus World of Science, which would make the perfect trip for friends and family over Spring. Mittell, Jason. Genre and Television: From Cop Shows To Cartoons In American Culture. Kentucky: Psychology Press, 2004. Print. Sabile, Carol. Prime Time Animation: Television Animation and American Culture. London: Routledge, 2003. Print. I like lavenders and cupcakes. Sometimes I like to put them together.